Warsaw’s Lucas Howett has logged many miles on lanes, paths, and roads in training and competition, and the effort and the success the Tiger cross country and track standout has experienced has paved a path to the asphalt and trails in Macomb Illinois. 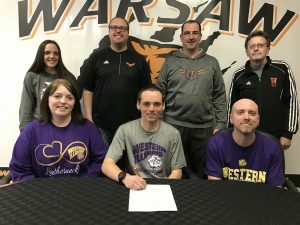 Howett signed a letter of intent to attend Western Illinois and run track and cross country for the Western Illinois Leathernecks and coach Nick Maas. A four-year letterman and All-Northern Lakes Conference selection in cross country under coach Jim Mills, Howett enters his final track season where he will earn his fourth letter for the Tiger track program and coach Matt Thacker. This past fall, the senior standout qualified for the IHSAA State Cross Country Finals and earned All-State Honorable Mention. In track, Howett has qualified for the regional twice in the 1,600 meter and 3,200 meter run. Howett has not only displayed a true dedication and focus between the gun and final chalk line, he has carried this throughout the school day, in the classroom, and weaved this beyond the school walls into the community. A member of the Fellowship of Christian Athletes, National Honor Society, Future Farmers of America, he also served as a Tiger Basketball statistician and assisted with the Tiger Student Athletic Board while amassing an impressive 10.4 Grade Point Average. Intending to major in Agriculture Education with a minor in Agronomy, Howett looks forward to working with the Western Illinois program. The Leathernecks are members of the NCAA and the Summit League. Front Row (L-R): Dawn Howett, Lucas Howett, Nate Howett. Back Row (L-R): Amslie Howett (sister), Rob Peters (Assistant Track and Cross Country Coach), Matt Thacker (WCHS Track & Field Coach), Jim Mills (WCHS Cross Country Coach).